Australia’s wealth distribution is not only unequal, it’s faring worse than other OECD countries write social historian Christopher Sheil and emeritus professor of political economics Frank Stilwell. 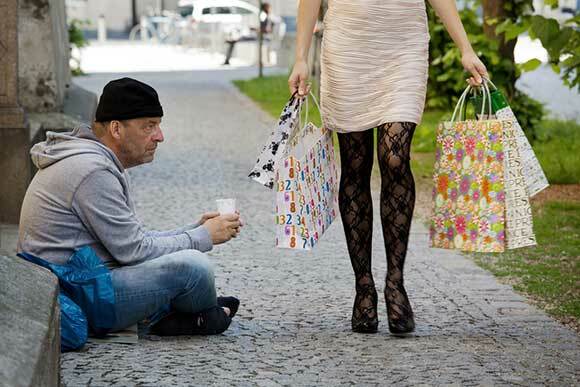 Australia’s wealth distribution is not only unequal, it’s faring worse than other OECD countries write social historian Christopher Sheil and emeritus professor of political economics Frank Stilwell, in this article which first appeared in The Conversation. Australians often pride themselves on living in the land of the “fair go”. However, the available evidence shows the distribution of wealth in this country is no more egalitarian than the average for the OECD countries. In fact, depending on how wealth is measured, Australia may have above average inequality in wealth distribution. 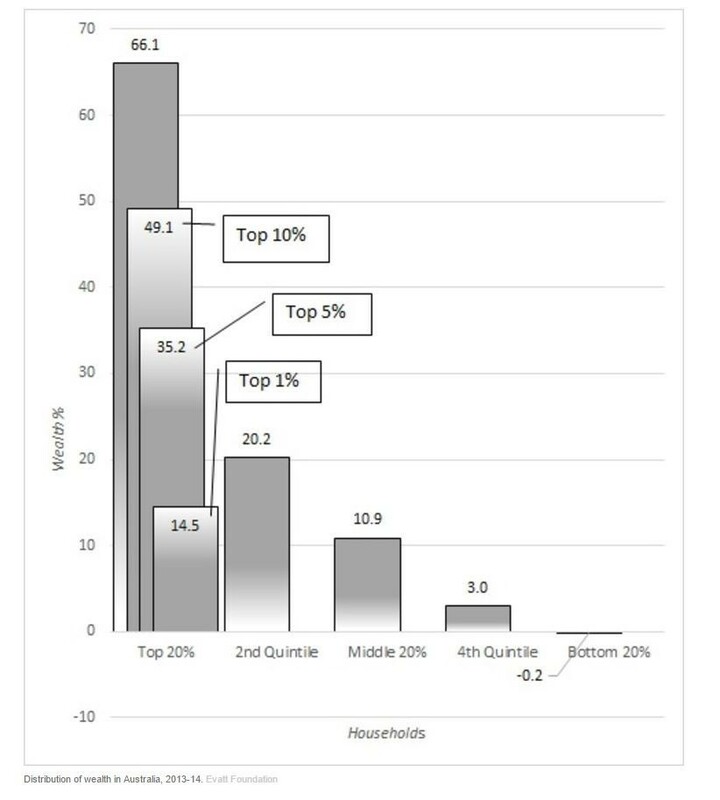 Most think of inequality in terms of income differences between rich and poor people. But even more fundamental are the differences in the value of the assets that people own. It is the presence (or absence) of this accumulated wealth that determines people’s social position and their opportunities in life; who gets what depends substantially on who owns what. Until recently, we have known very little about wealth inequalities. The last official national census of wealth in Australia was 101 years ago. In recent years, however, international data compiled by the OECD and political economist Thomas Piketty’s research have provided a better basis for seeing how Australia compares with other nations. A new report by the Evatt Foundation marshals the existing evidence on wealth in Australia. As you would expect, Australia as a whole has become much wealthier since 1970: the total stock of capital has grown twice as fast as national income during the decades since then. But what is more striking is the marked increase in wealth inequality over the same time. We have become collectively richer but much more unequal. A reasonable estimate is that, currently, the poorest 40 per cent of Australian households effectively have no wealth at all: about half of them actually have negative net wealth because of their personal debts. At the opposite pole, the wealthiest 10 per cent have more than half the nation’s total household wealth. The top 1 per cent alone have at least 15 per cent of the total wealth. This affluent elite is getting cumulatively richer – not only when compared with poor households but also, significantly, relative to the middle 50 per cent of households. Two faultlines are widening. One is between the bottom 40 per cent and the rest, and the other is between the top 10 per cent and the 50 per cent in the middle. The latter division is ultimately explosive, since it indicates that the broad Australian middle class is getting a shrinking share of the fruits of economic progress. How does Australia measure up internationally? Compared with the 16 other OECD countries for which comparable data exists, Australia looks slightly more egalitarian than average if all forms of wealth are included. However, this is largely because of ownership of household durables, such as clothing, furniture, appliances and cars. The household durables represent 12 per cent of our wealth compared with the OECD average of 7.7 per cent. There are many reasons why durables should be excluded to improve comparability. The national accounts, for example, excludes durables from the aggregate household balance sheet. Piketty’s analysis also excludes durables. Australia’s HILDA survey excludes all durables except cars. The Evatt Foundation report shows that if we also exclude durables from the OECD wealth data, Australia’s top 10 per cent of households own about the same wealth share as their counterparts in France, Norway and Canada. The only rich countries that are clearly less egalitarian than Australia are Austria, the Netherlands, Germany and the US. What does this mean for politicians? Ultimately, the case for Australian egalitarian exceptionalism is weak. Australia is not more equal than most other comparable rich countries, and its wealth inequality is growing. Dealing with this situation is perhaps the biggest challenge facing our political leaders today, although you might not get this sentiment from the victors’ public statements in the recent election. Other recurrent political economic stresses need attention – most obviously, climate change, financial instability and job insecurity. But these challenges are interlinked, and they all need managing in relation to economic inequality. If the policies are not equitable, they will not be sustainable. An emphasis on narrowing wealth inequality needs to be present in all public policies. These range from pensions and superannuation to disability services, housing provision, transport, regional policies and taxation. Unless this integrated approach is taken, the cherished belief in a “fair go” will be a dwindling feature of life in Australia. The evidence suggests it is already disappearing. Christopher Sheil PhD is a visiting fellow in history at the UNSW Australia. He is a social historian, whose principal interest is the history of labour in society. Frank Stilwell is an emeritus professor from the Department of Political Economy at the University of Sydney. He is a well known critic of conventional economics and an advocate of alternative economic strategies which prioritise social justice and economic sustainability. He has taught for over 40 years at the university and twice been awarded the University’s Award for Excellence in Teaching. Stilwell is co-ordinating editor of the Journal of Australian Political Economy, and is on the editorial boards of Regional Studies, Social Alternatives and Australian Options. So, isn’t this an indictment of our social welfare, health, education and training spending as opposed to income inequality ? In turn, we then have policies such as negative gearing that, in effect, subsidise loss making investment. If we can’t get basics right like taxation, spending and individual accountabilities right, this is the inevitable outcome. Labelling people as “lifters” or “learners” is hardly helpful but people who take a risk should be better rewarded.